I was at a meeting for the Food Sustainability Project last week and the folks in the group kept talking about making and eating quinoa burgers so I had to give it a try myself. My husband wasn’t super keen on the idea of a quinoa burger so when I purposed we make them more like Falafel balls and serve them with pita and tzatziki he was suddenly converted. 1/4 cup plain dried breadcrumbs (I toasted a slice of bread and then blended it with my immersion blender…it’s all I had and worked great! In a bowl mix the tomato paste and wine until smooth and creamy. Add garlic, onion, cooked beans, bread crumbs and pulse with immersion blender until fairly smooth. 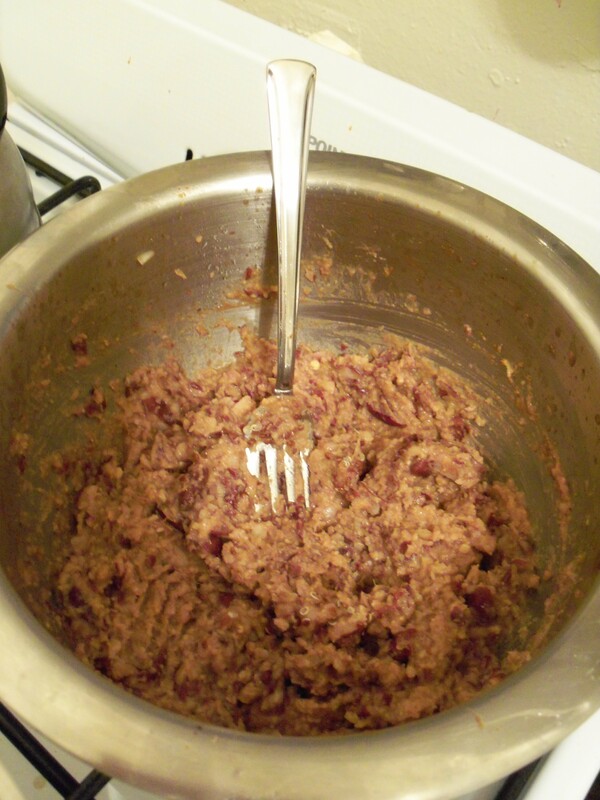 You can leave some partial chunks of beans unblended for texture. 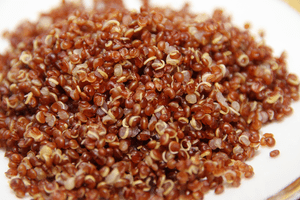 Then mix in spices, seasonings, egg and cooked quinoa. Form mixture into little balls about the size of a ping-pong ball, flattened. 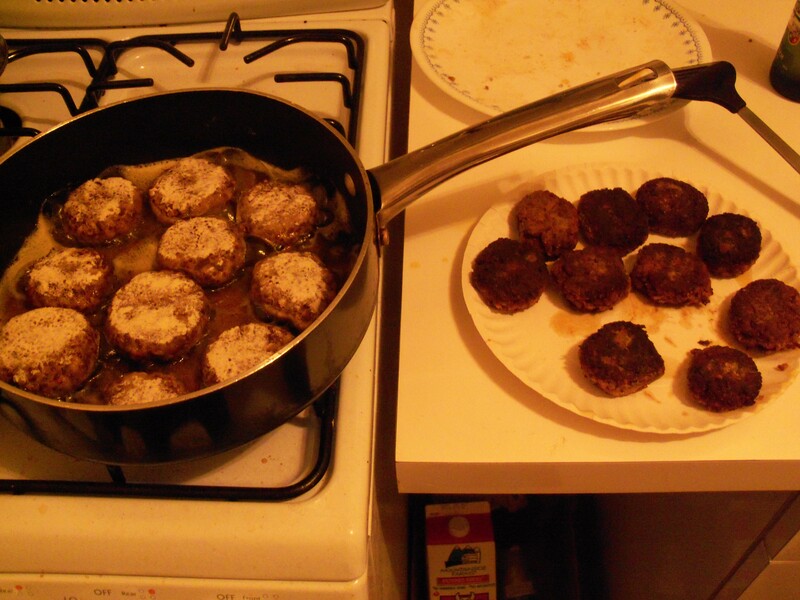 In a large nonstick skillet, heat oil over medium; cook balls until browned and cooked through, 8 to 10 minutes per side. Optional: before frying lightly coat ball in flour to keep from sticking to pan and help to form a nice crispy outside. Meanwhile, in a small bowl, combine yogurt, lemon juice, and two cloves minced garlic; season with salt, pepper, dill, and olive oil for your tzatziki dipping sauce. Serve quinoa balls in pita topped with tzatziki. Add lettuce, avocado, fresh onions, avocado or anything you might like into your pita! 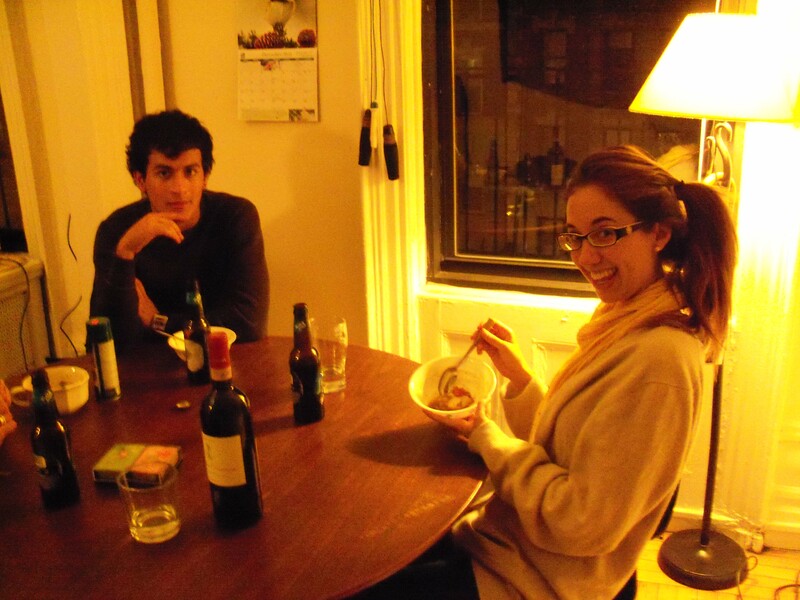 I had some friends visiting last night and after the Thanksgiving holiday not too much food in the fridge for a meal. I found a bag of carrots, half an onion, and a potato in the fridge and looked around at my grains, spotting the green lentils. 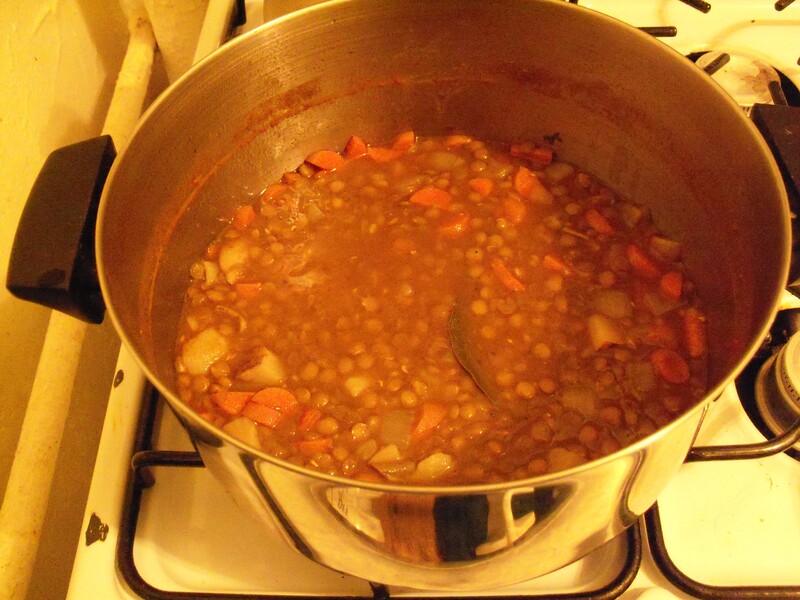 The best thing to make on such short notice (no need for soaking) was lentil soup. I love soups because you can pretty much throw in whatever you want, whatever is lying around and it always turns out delicious and nutritious! In a large soup pot heat the olive oil, toss in the onions and let cook until they are soft and translucent. Then add and saute the potatoes and carrots. Dissolve the tomato paste in the red wine and add along with the broth/beet juice to the pot. Throw in one bay leaf and add your lentils. Now add enough water to fully cover all your ingredients (lentils soak up a lot of water). At this point or flavor I add spicy paprika, salt & pepper, a dash of oregano and a dash of cinnamon. Cover it and let it simmer until the lentils are tender. Enjoy! I know it’s been a long time since I’ve posted. Grad school suddenly crept up on me with a vengeance, I guess it felt I wasn’t paying enough attention to it. But through it all I did still get some much needed cooking/baking in so that I could stay focused on school and keep my brain functioning. Cut up your choice veggies into big chunks. 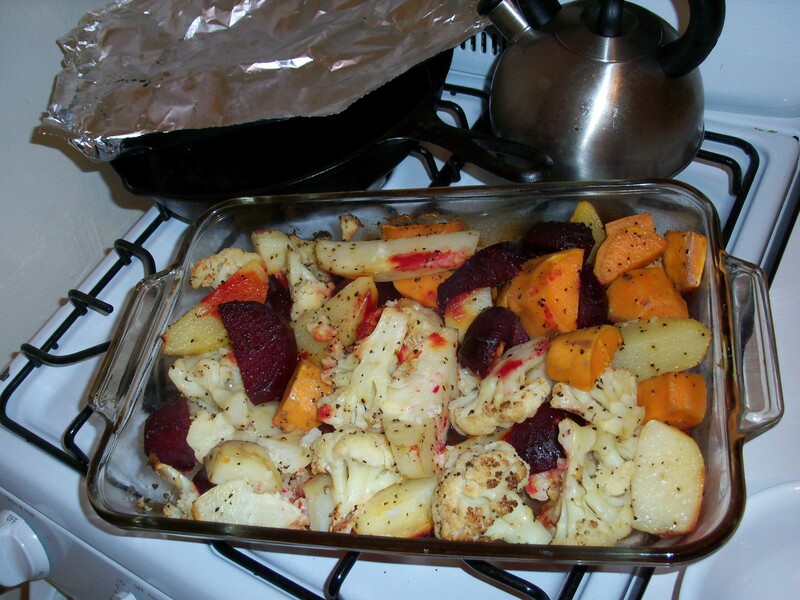 Cauliflower, beet, potato and a head of garlic to roast are usually our staples. Put them into a bowl so you can evenly coat salt, pepper, and olive oil on them (and other added spices if you like). Place them in your biggest pan covered in the oven for about an hour. Once they are mostly tender with a fork poke take the foil off and let them cook another ten minutes of so. They are slow roasted and the flavors really come out strong this way, that’s why we don’t usually add other spices. It’s nice to have excess oil in the dish, it makes a delicious sauce flavoring if you want to pair your veggies with rice or orzo. Also I made a loaf of homemade bread a few weeks ago…. Very hearty and seeded. I honestly don’t remember all the steps and ingredients, I just wanted to post it to tell you how easy it is to make bread, and so much fun. It makes you feel so accomplished to eat your own bread. 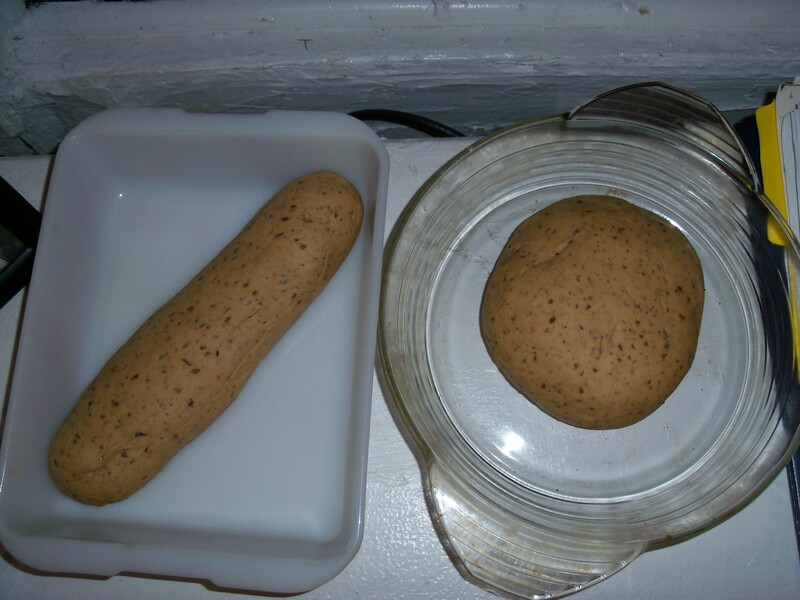 All you basically need is yeast (different yeasts will flavor the bread differently), water, and flour (different flours of your choice will flavor the bread differently too). 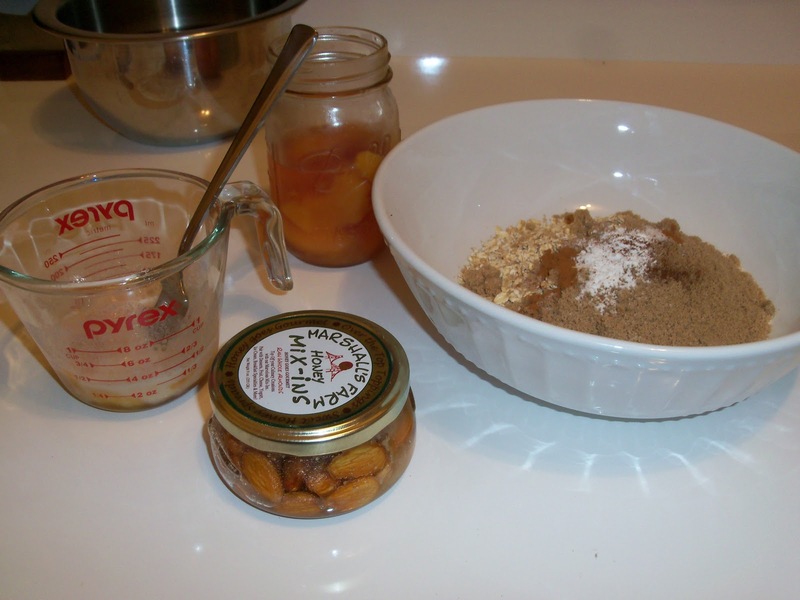 You can also add in seeds, sugar/honey for the yeast, butter, etc. But those first 3 ingredients are all you really need. The reason people usually don’t make bread, I think, is that the planning time and time to satisfaction of when you actually get to eat the bread is very long. You have to make your dough and then let it rise until it’s double in size…or overnight even, in the fridge. Then you pound it down, shape it how you want it into the dish you want to bake it in and let it rise again. You finally cook it once it has risen the second time. Again, it doesn’t take much effort, just time and planning. 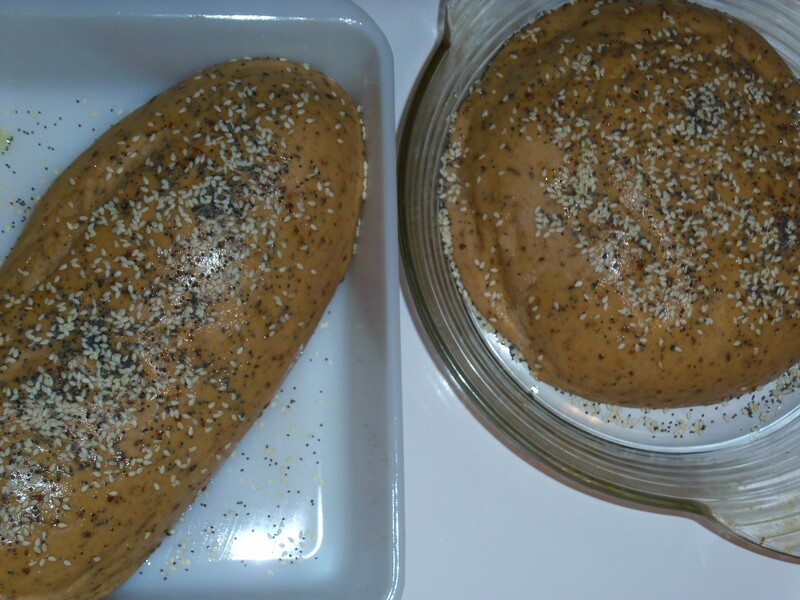 Check out my loaves…they were seeded with flax, sesame, and poppy and were very hearty (all whole wheat flour), they packed a punch toasted and dipped in hummus. 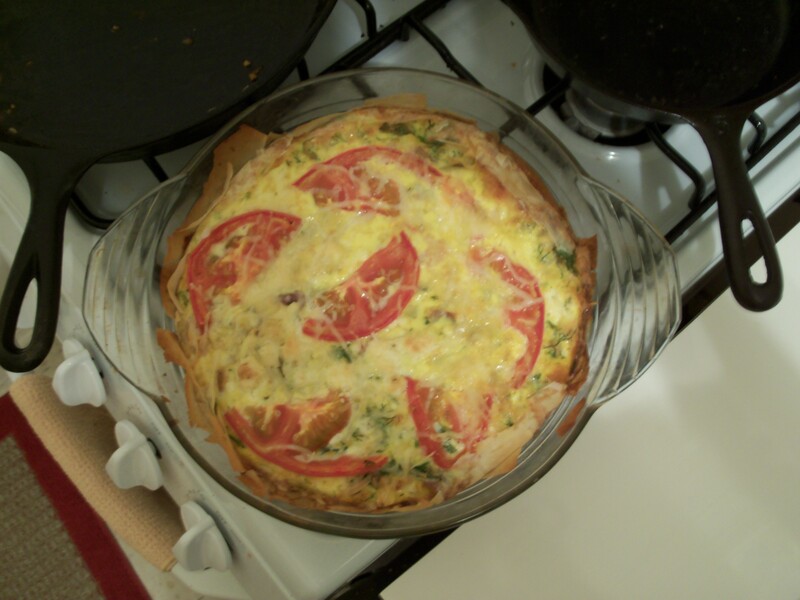 The first step is to either buy or make a pie crust (or forgo the crust and you have a frittata, just as delicious). Or, as I did this time around, make a crust out of filo dough! Filo dough cooks up very light and flaky and is magical. You can piece the sheets together like you’re making a paper-maiche covering on a balloon, the key to the process is to use melted butter (I prefer to melt on the stove top and avoid the microwave) as your “glue”. Everywhere the filo sheets overlap you need to have the butter gluing them together. Line 8-10 filo sheets on the bottom of any size pan you wish and you have your crust! Since I we are making a quiche I choose the standard glass pie plate. 2. Saute Onion in olive oil about 2-3 min and add garlic. Let cook for about 2 more minutes. Add diced squash, mushrooms, tomatoes, ginger, cumin, paprika, salt and pepper and let cook until tender and the liquid is absorbed; about 10 minutes. The squash should be tender but not squishy, it is still going to cook in the oven for 30 minutes. While this cooks whisk the eggs up in a bowl. 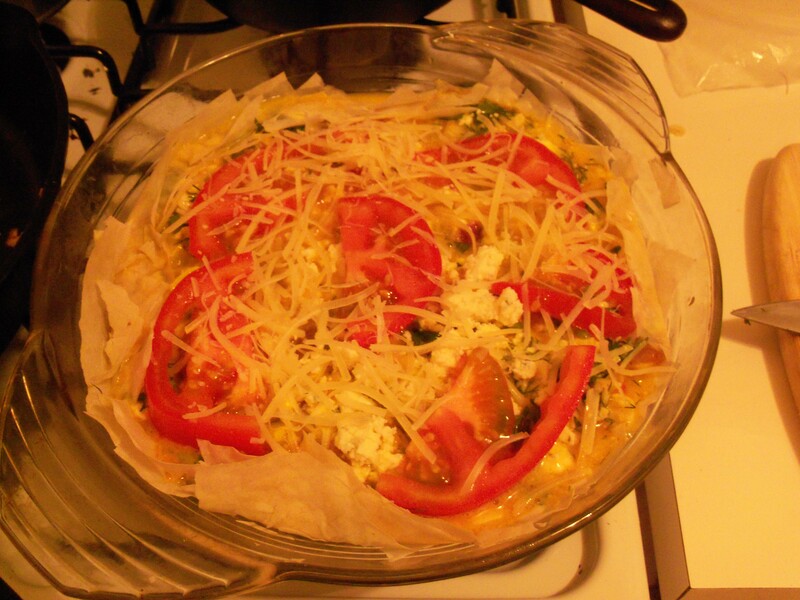 To the eggs add the corn (freshly sliced off the cob), dill, parsley, and cheeses. 3. When the squash and mushroom mixture is finished cooking add it to the egg mixture. Stir well and pour into your pie plate. Top it off with the parmesan cheese and nicely arrange the sliced tomatoes on the top. Cook for 30-40 minutes. When the egg isn’t running and the filo is golden brown and flaky you’re done! If you let it cool for about 5 minutes before cutting into it it will set and solidify a little better. *The joy of cooking for me is to play around and combine different ingredients following a basic skeletal plan of a recipe. I encourage you to use seasonal veggies from the markets for this dish. So depending on the season the squash and corn can be replaced with broccoli, zucchini, spinach (if uses a green make sure you cook off the liquid so the crust doesn’t get soggy), etc. You can also change the cheeses. Monterey Jack works well as does white cheddar. And if you prefer you can cook in butter instead of olive oil. A trick to successfully shaving off the corn from the cob and not getting corn kernels bouncing all over your kitchen is to put a paper towel or kitchen towels under the corn cob so that the kernel will “stick” there. Sometimes I get a hankering for food late at night, and obviously throughout the day too. Most of the time, especially when it’s 1am like last night, I like to look through my cabinets and see what the ingredients I have on hand will allow me to make. It’s a fun challenge and extremely satisfying when you have success. It’s provision based cooking, in this case baking. I looked through the fridge and freezer (where my flower and flax is kept to keep it from going rancid) and found chocolate chips and a banana and knew I was about to embark on some kind of banana bread. No eggs or butter though in the apartment, so I threw in a bit of olive oil and in place of applesauce (that often replaces olive oil) I used some peaches I had canned over the summer. 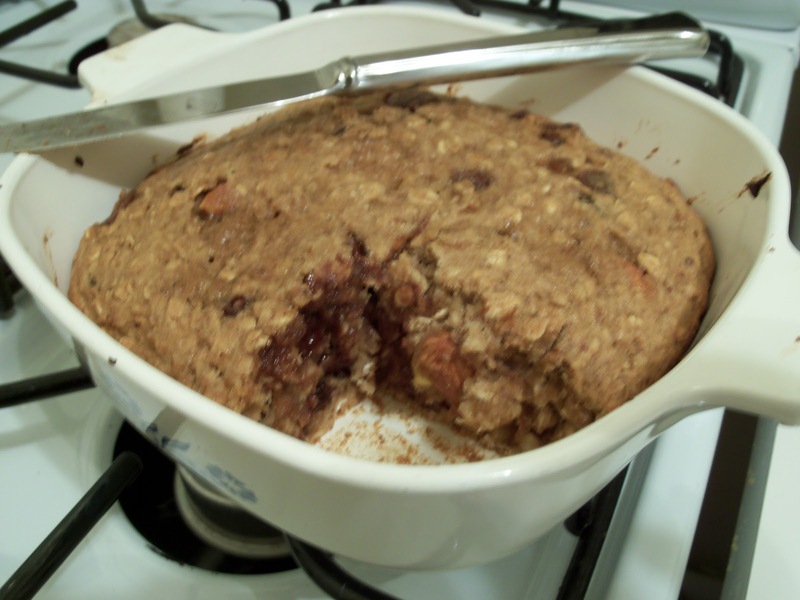 To make it a bit healthier I cut down my flour and added rolled oats and ground flax seed. It turned out great! I’ll share the make-shift recipe, but I hope from reading this you’ve gotten a little inkling and inspiration to play around in the kitchen just like I use to when I was a little girl making witches brew stew in the back yard with everything that was rotting and found in my sandbox. See how I’ve progressed! 1. That’s it! Mix all the dry goods together first. Then the “wet” ones, smashing the banana into the consistency of baby food. And then mix the dry and wet together. Turn in the nuts/raison/chocolate chips at the end. Preheat oven to 350F and bake in a small dish (this is one loaf of bread) for 25-35 minutes.